Item # 309729 Stash Points: 1,595 (?) This is the number of points you get in The Zumiez Stash for purchasing this item. Stash points are redeemable for exclusive rewards only available to Zumiez Stash members. To redeem your points check out the rewards catalog on thestash.zumiez.com. Made for the fans of the herb and the streetwear connoisseurs alike, HUF presents their Plantlife Blue Iris and Orange Striped Crew Socks. Made from a plush cotton/polyester/spandex blend, these socks offer daily comfort in an overall striking aesthetic. 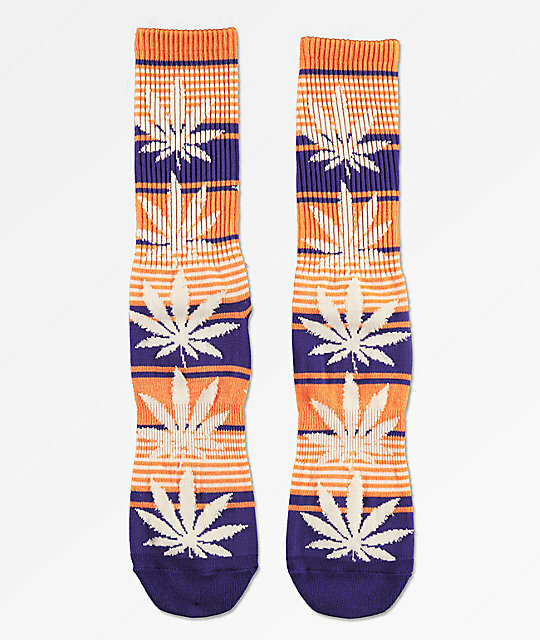 Plantlife Blue Iris and Orange Striped Crew Socks from HUF. Purple, orange and white striped pattern throughout.